Advent Calendar Extravaganza is the festive event of the season! This ‘hop with a twist’ was dreamed up byTaheerah Atchia and features surprise destinations each day! Joining in the fun with Taheerah are ONE HUNDRED special guests – each serving up some fantastic Christmas inspiration! Just like an Advent Calendar, you’ll never know where you’re going to be visiting next until you ‘open the door’! Hey all! I’m excited to be behind door #20 and participating again this year in the Advent Calendar–I love advent calendars and it’s such a great idea to have a virtual one! So excited, I have not one, two, three or four offerings today, but five that feature awesome Pinkfresh collections, and a mini journal that mixes it up with Crate Paper’s Snow & Cocoa. 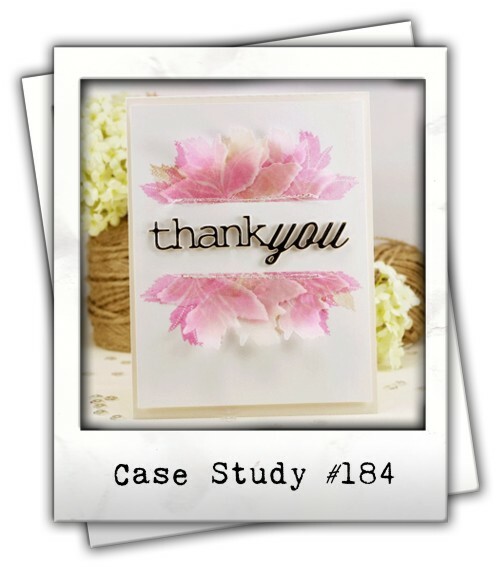 I love Pinkfresh designs, and their papers are such a joy to work with–they almost create a card by themselves! You can see an earlier collection of Pinkfresh creations I designed here. First up some fun, simple cards using Oh Joy, Christmas Wishes, Indigo Hills collections from Pinkfresh and ephemera from Snow & Cocoa. 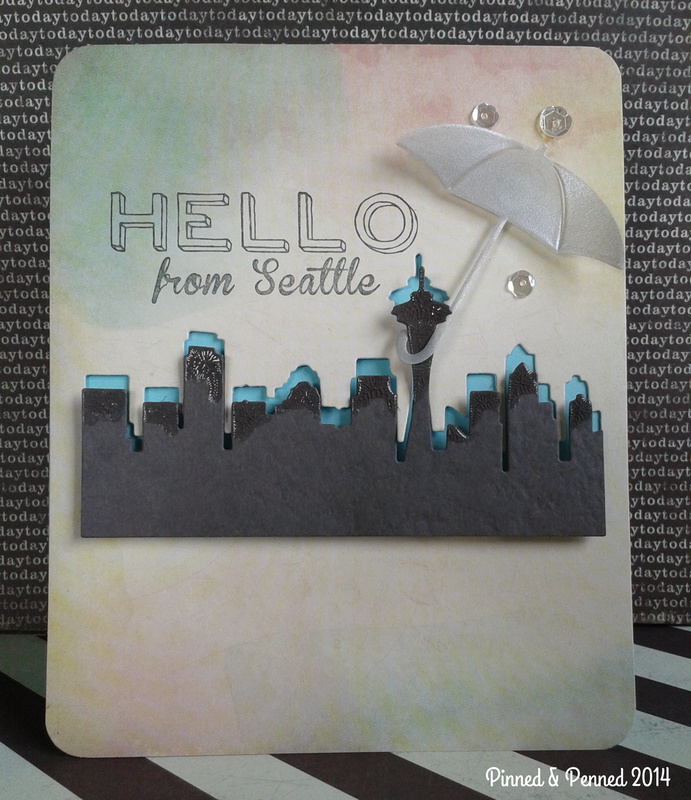 A few puffy stickers and acetate sentiment make a simple, but fun card. 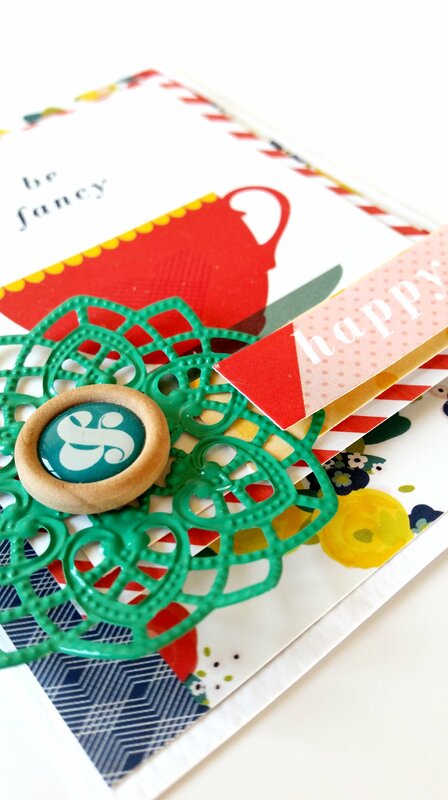 Crate Paper’s acetate deer works perfectly with the clear pieces from Oh Joy! 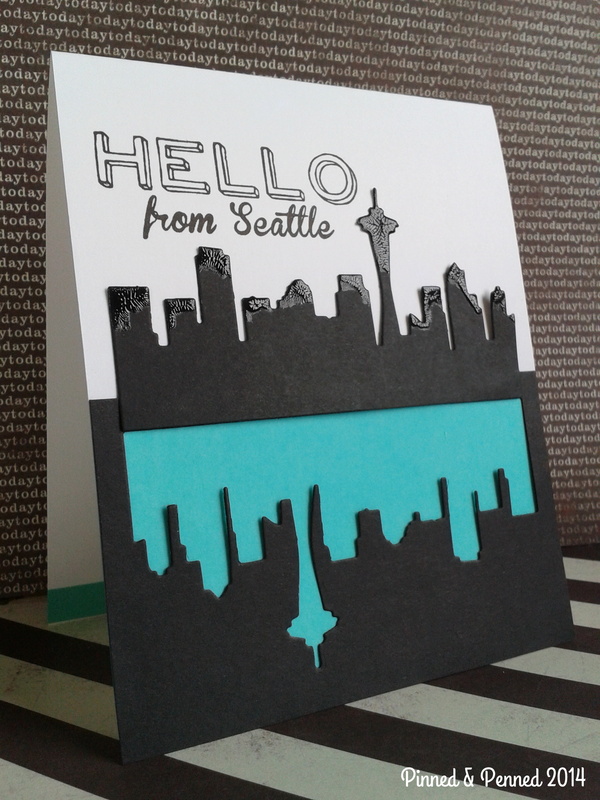 So do the stripes and colors from Indigo Hills base paper. 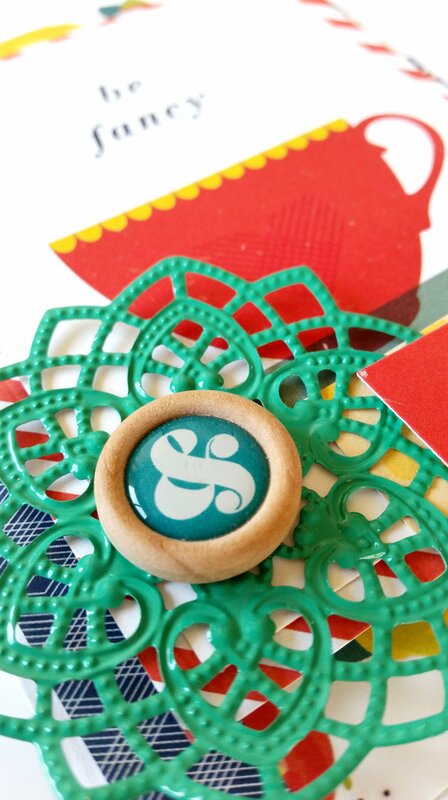 An easy shaker card can be made from the acetate pieces in the Oh Joy ephemera pack. I stamped the presents from Christmas Wishes and made a little sequin strand to top the card.The bottom features a rubber sticker from Pinkfresh. 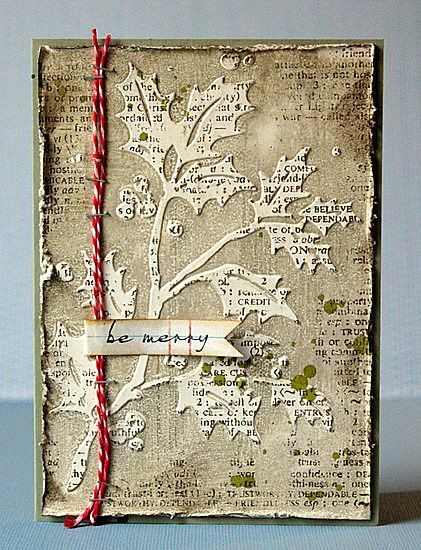 I created a repeat background with house stamps from the Christmas Wishes collection, copic colored and added mica flakes. The bear is from the same stamp set, colored and fussy cut. 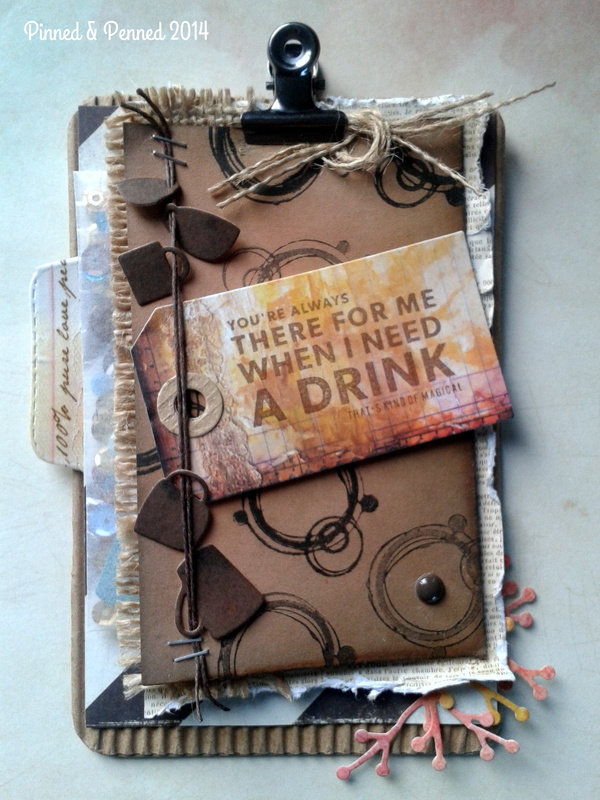 Layered papers and the sentiment are from Oh Joy. Next up, my mini journal. 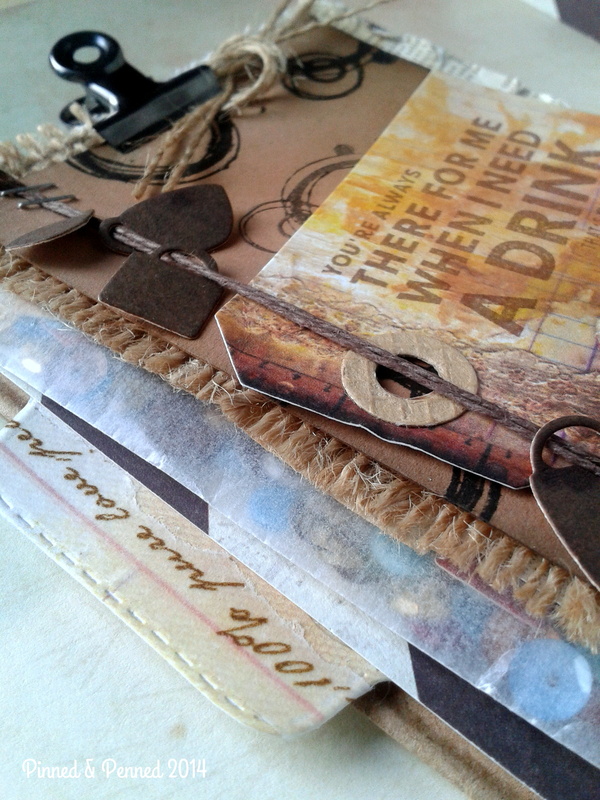 I have made quite a few of these layered journals, two of which you can see here and here. I plan to use this one for our trip to Indianapolis with some changes, but here is a way you can make one merging the Snow & Cocoa, Oh Joy, Indigo Hills and Happy Things collections! 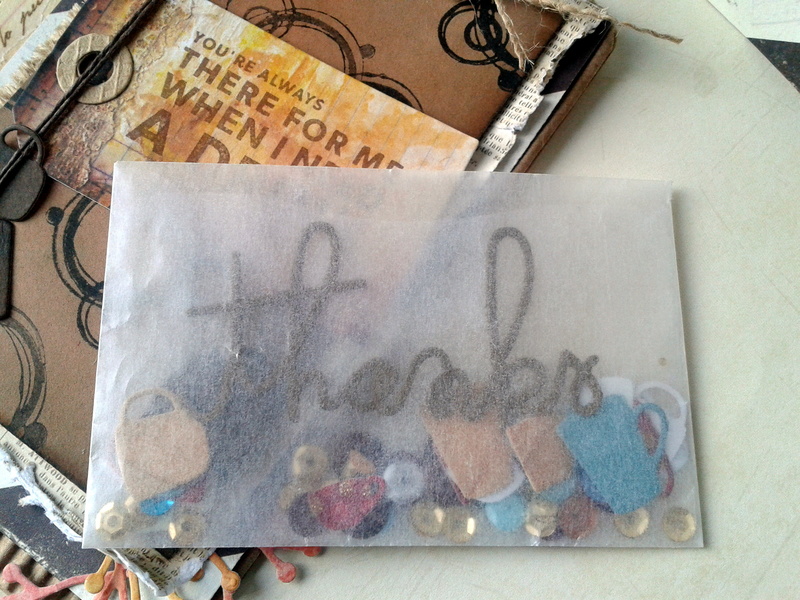 When making the 2-layered covers, I always leave openings for tags as a way to close the journal. 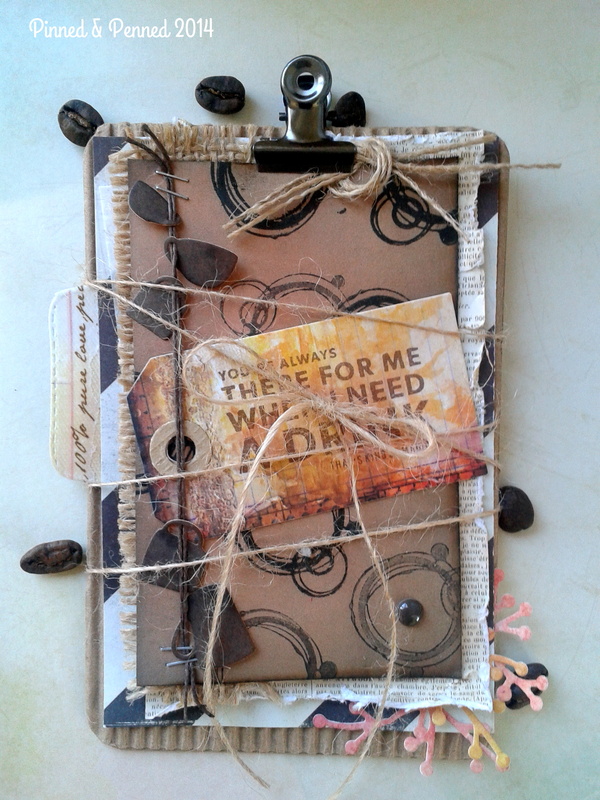 Inner flaps have pockets to store tickets, photos, receipts, or journal cards. 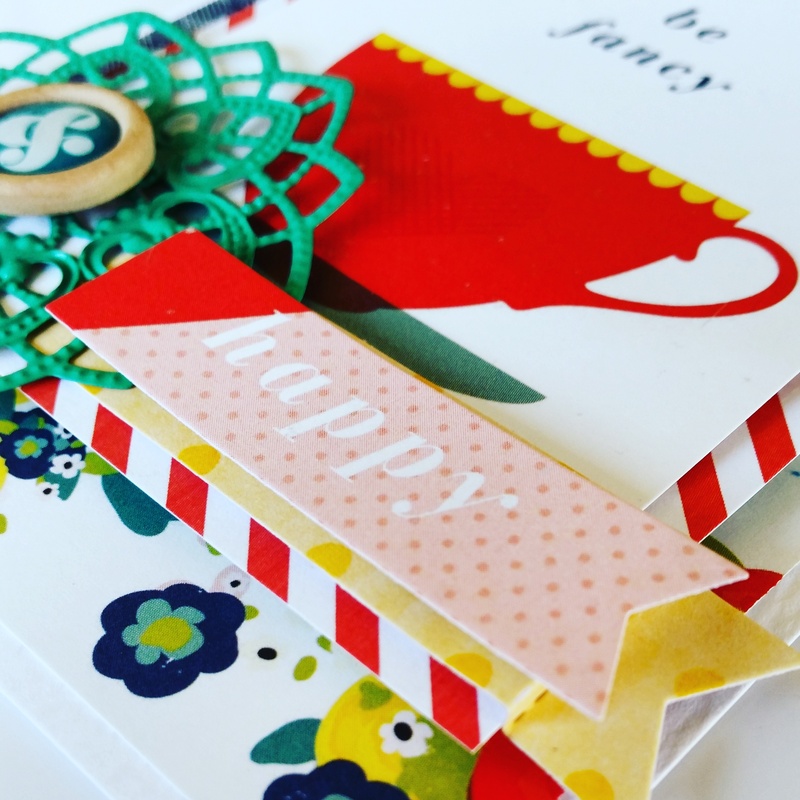 Love howthat Crate Paper girl works with the Oh Joy tree paper! The Indigo Hills blue splattered paper is like a winter snow blast, much like the weather we’ve been having in Indy and across the US. 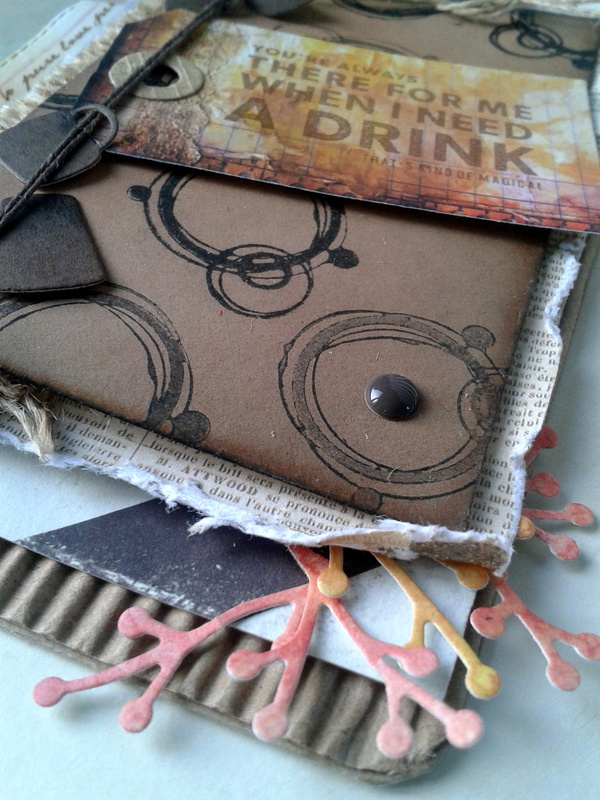 The inner book here features more Indigo Hills paper with a pocket for ephemera and a wood clip from the same collection to hold a ticket or photo. 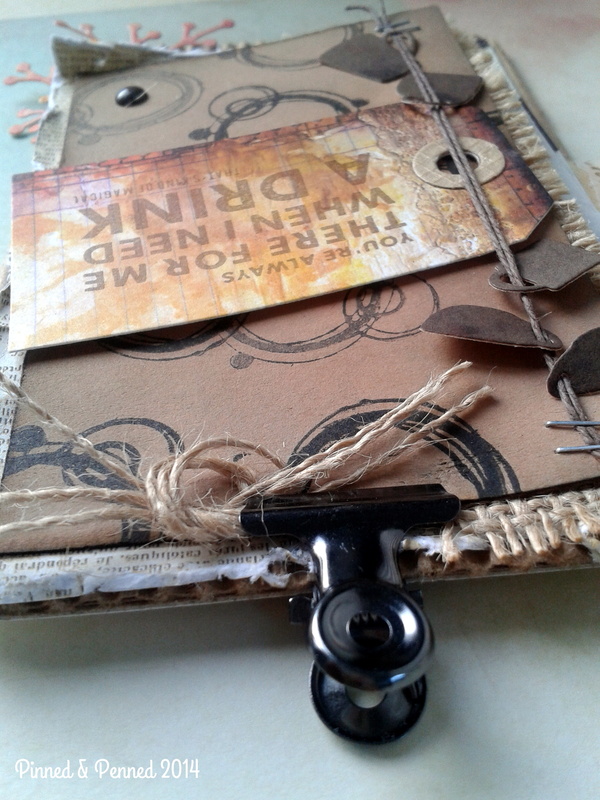 Here’s the back inner cover and below, a small journal I’ve embellished with wood sticker from Happy Things. The back of the journal with washi from Oh Joy and tag from Snow & Cocoa. What is different about this journal is that I have created more of a spine so the journal can accommodate more pages, photos and ephemera. Overall spine is 1/2″. 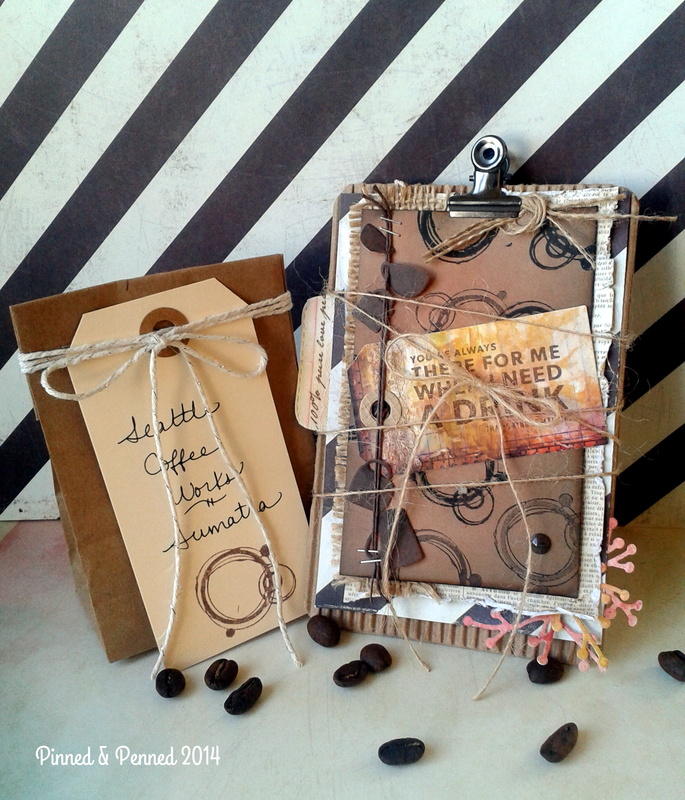 The journal is 3.5″ wide by 7″ long. Hope you found some holiday inspiration here today and before you go, make sure to keep reading. You could win some of the products featured here today!! It’s not a party without a prize – and with prizes every day there are several chances to win! Today’s prize is generously supplied by Pinkfresh so you’ll definitely want to win! Simply leave a comment on this post – then head back to taheerah-atchia.com and leave a comment there too! You must leave a comment on Taheerah’s blog as well as mine in order to be eligible to win! Don’t forget to grab the other surprise destinations from Taheerah’s blog and head over to them to leave comments there as well to improve your odds even more! You have until 23:59 EST on 31st December 2016 to enter. 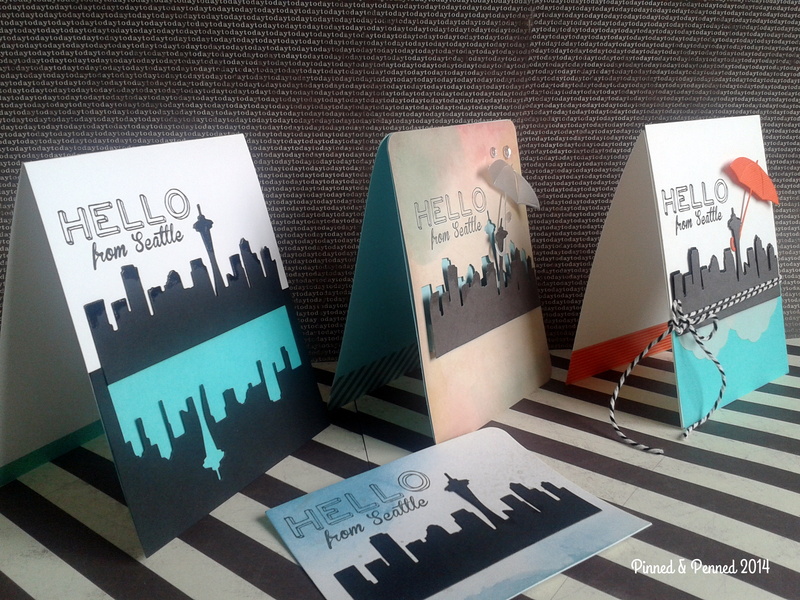 Travel over to The Heart Desires today to see my vacation mini album featuring Simple Stories and Carta Bella products! It’s a whale of a tale! Want more mini-album? Check out my summer mini here! 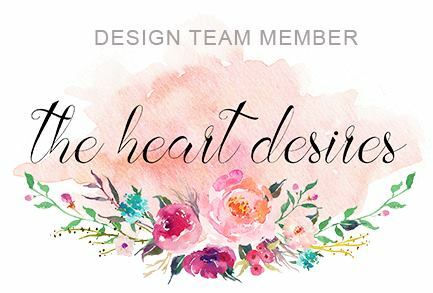 See you at The Heart Desires! Happy Birthday Lenae! 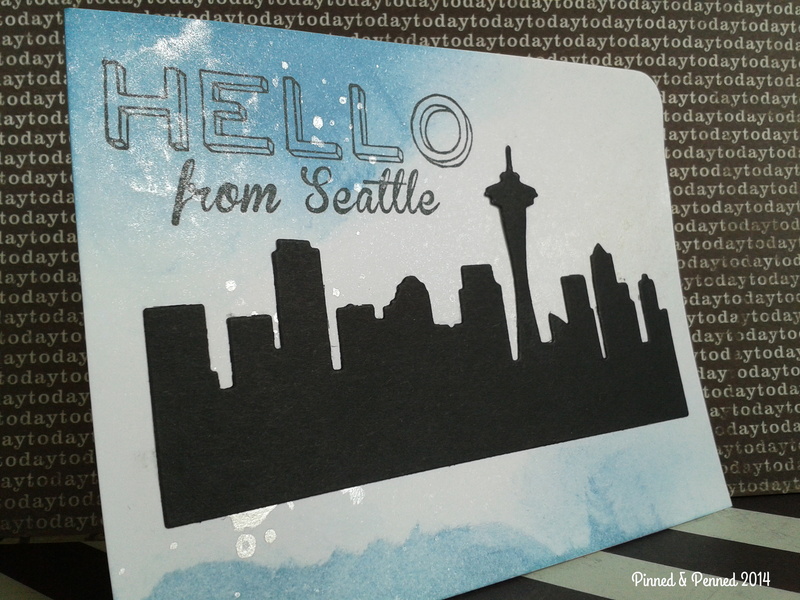 We PNW crafters are having a birthday hop, so make sure to check out the rest of the creations over at Amy, Katie, Kimberly, Tonya, Vicki, Toni and Lisa‘s websites! And speaking of lattes, pumpkin or not, it’s also time for another Coffee Lovers Bloghop! 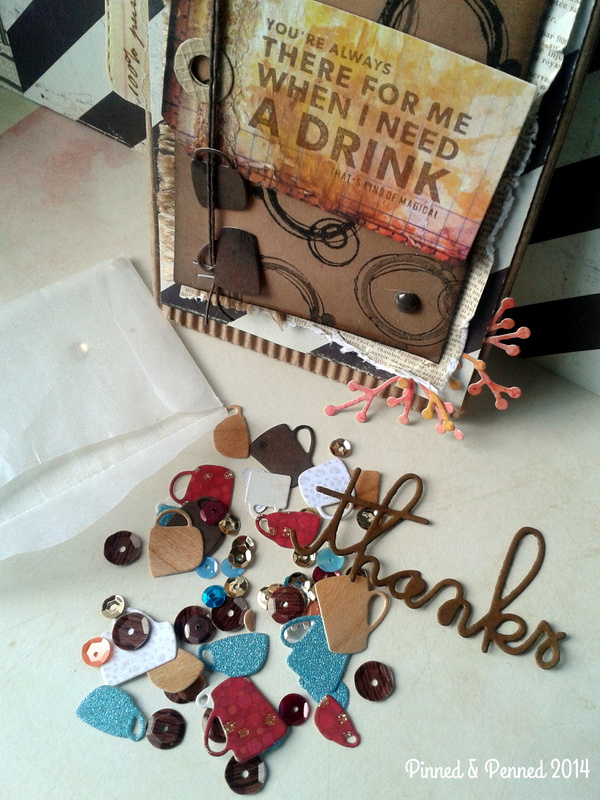 I really like participating in these hops as it is fun to look back at where I was creatively a year ago, but more importantly to look forward at all the new creations, participants, and products that have flooded the papercrafting market as a result of this coffee movement! It’s really quite amazing the traction and influence this Coffee Lovers Bloghop has had on the industry. There are 42 super sponsors offering give-aways for lucky participants! We’ll see how lucky I am as far as that goes. I am never a big winner when it comes to contests, but having the opportunity to create and participate is really all that matters to me. I have enough materials to last me a lifetime! And speaking of materials, if you leave me a comment, I, too, will offer up some blog candy for a few randomly chosen commenters. I absolutely love this paper from Shimelle; appropriately enough, it is called “Latte” and is part of the True Stories collection. 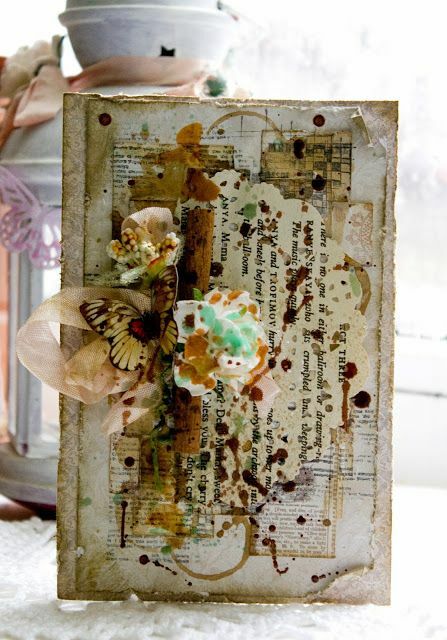 This particular two-sided paper has journaling cards on one side and that wonderful floral on the other. I layered them on some Tim Holtz watercolor paper. 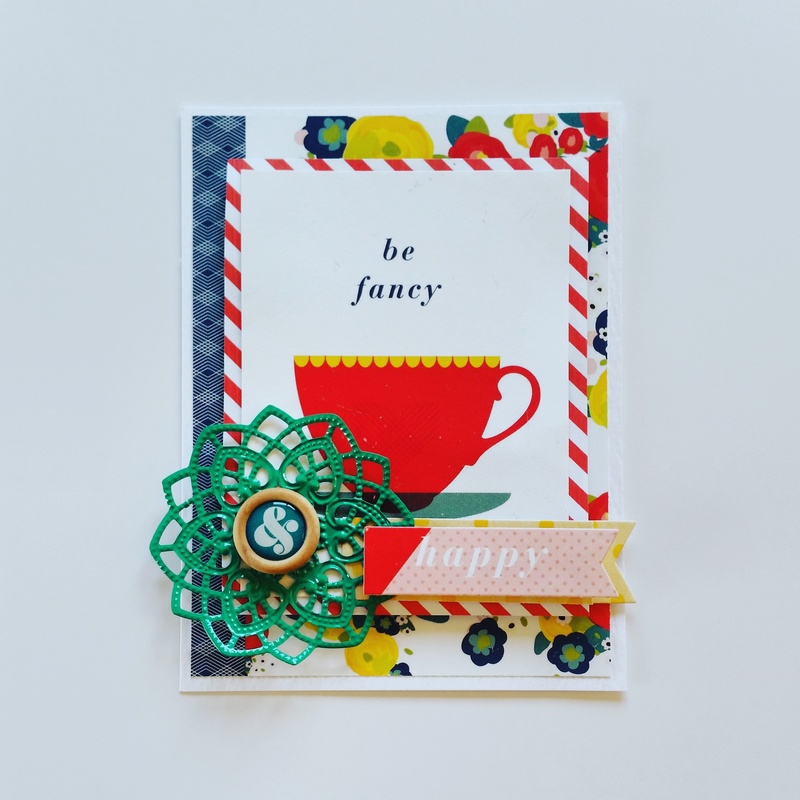 I was struggling to find a stamp or die cut that would work with the “fancy” sentiment and font, until mostly by accident I looked at one of the other journaling cards and realized the “happy” would make a perfect complement. And I LOVE how the red angle on the flag works with the angle of the cup! I cut two flags from different dies, and folded the yellow one over the side, giving some nice dimension and grounding for the other flag. Is that ampersand brad fabulous or what? 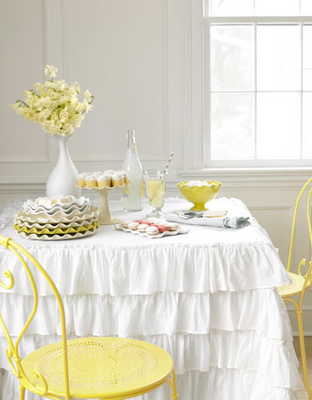 It is adhered to a metal embellishment from Basic Grey’s Market Spice line. I will leave you with a few of my favorite coffee images captured during our recent trips; vacations always include discovering new coffee and roasters, or revisiting old favorites. Hover over any image to learn more about the location and coffee! 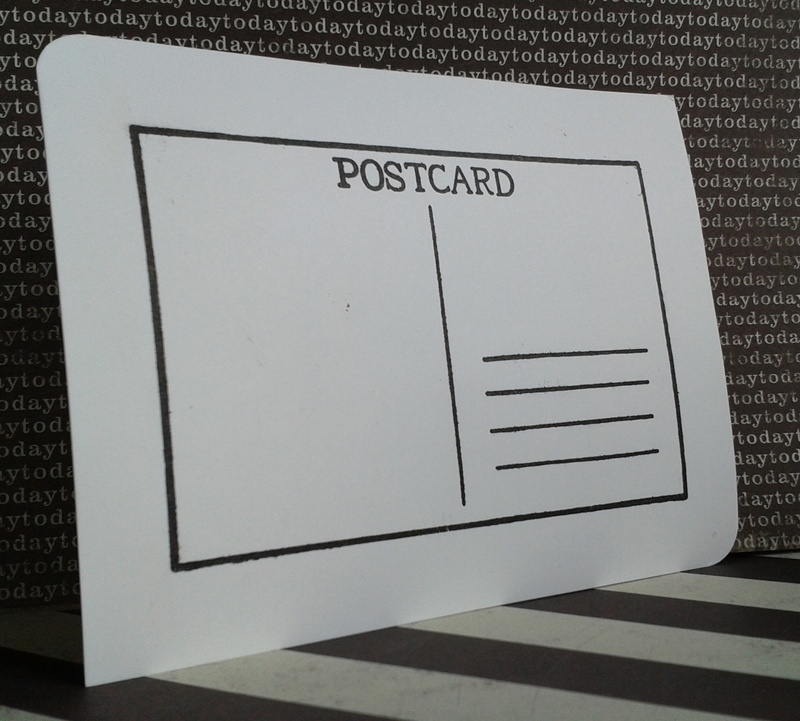 Want to see more of my coffee cards from hops past? Check out my portfolio page here. Thanks for stopping by and happy hopping!! 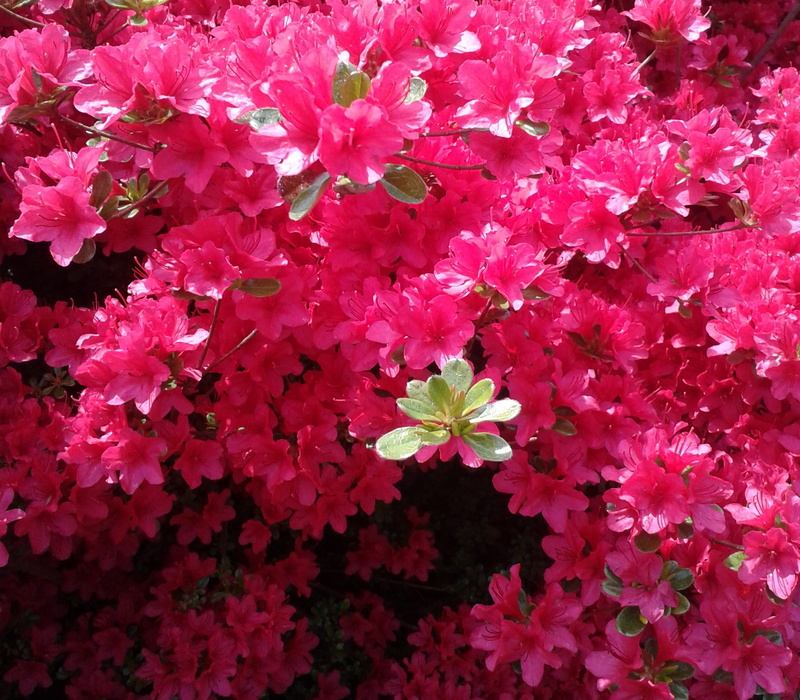 Good afternoon, all! As promised I am back with my second post featuring the other cards I created based on our current challenge over at CASE Study. If you haven’t dropped by CASE or read my post from yesterday, make sure to check them out, get inspired, and play along this week with us! Before I get to my pictures and products, I want to send a warm hello and thanks to all my new followers here and through Pinterest! 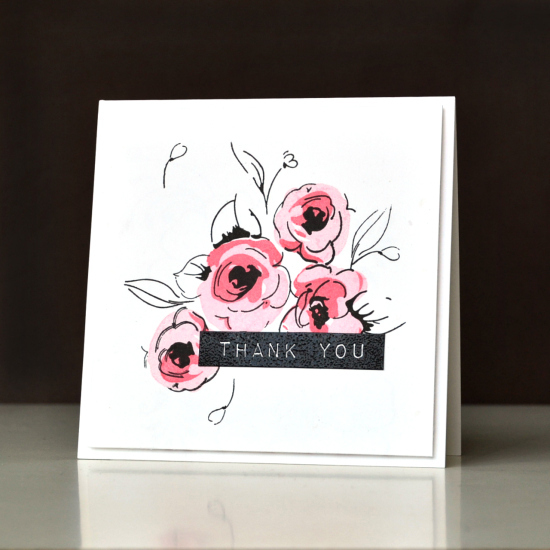 I also want to thank Chupa of Random Acts of Creativity, and owner of CASE Study, for the chance to join the fabulous team over at there this last month, alongside the incredibly talented Sarah Gough of Thinking Stamps! I have had the opportunity to reach a greater audience and meet more talented creatives as a result! I am excited about growing my network! So the cards that follow are for you all! 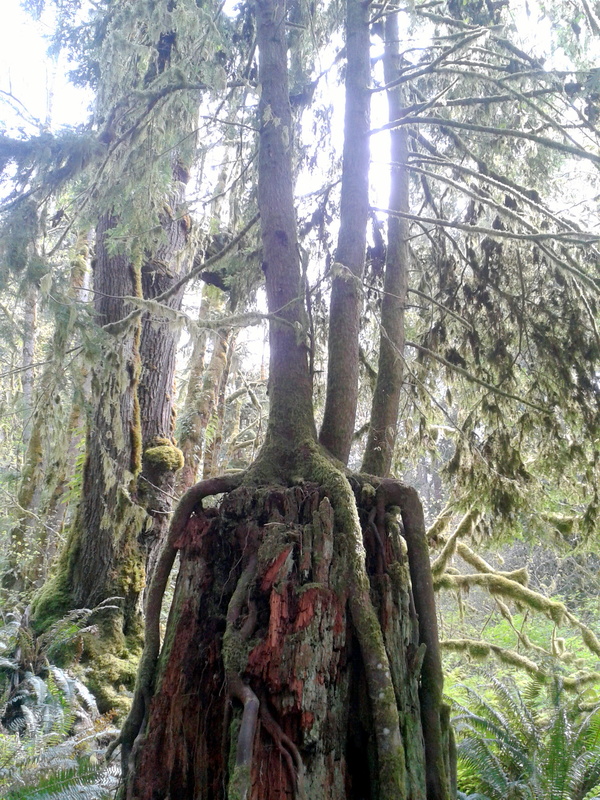 Hello from Seattle! Additionally, last week I joined Stamp Nation, run by the energetic and passionate Catherine Pooler! After hearing about it from Maureen of MamaMo Stamps and Chupa, I just had to check it out. I have experienced a wonderful welcoming over there and encourage you to explore all the community has to offer in the way of videos, discussion, and inspiration! Lastly, a bit of news I thought I would pass on! I just read that Tasnim, a design team member at CASE Study, and the brains behind the stunningly clean and not-so-simple cards over at Cards & Bookmarks has started her own stamp company, Altenew, with Jen Rzasa of Our Change of Art! So they will be bringing some awesome combined talent to what will be fresh, artful, modern designs! See either site for the details! Congrats, ladies! 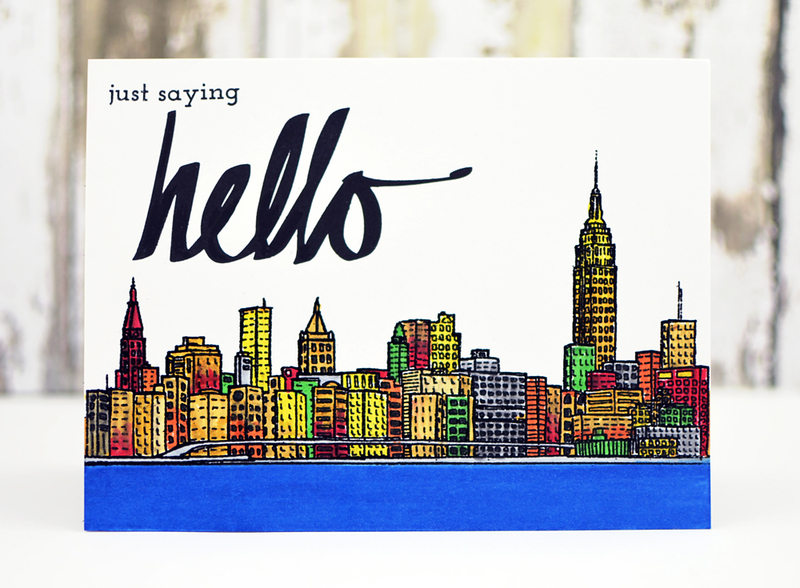 Jen Rzasa’s card from their new set of stamps! Tasnim’s Card featuring their new stamps! Okay, now on with the show! Here’s Joni’s inspiration card just to remind you! Since the card I featured this week at CASE was giving me such a hard time, I decided to try a few different options. This one here I really like in its graphic CAS style. I followed that center line that Joni established in her card with the positive and negative die cuts. I used my turquoise vellum here as well. I had really wanted to experiment with Ranger’s Crackle Accents as I had it in mind to create a rain-like appearance on my buildings, but I wanted more texture than what Glossy Accents could provide. I like how it turned out, but I was pretty controlled in my application on both cards. So I think freeing myself up a bit, experimenting with more coverage, might make a better impact and more visual interest. Here is the other card using the Crackle Accents, and this time a much softer, ethereal palate inspired by Joni’s pink vellum leaves. This time I created the front panel with Crate Paper’s DIY Shoppe water-color paper, and adhered it to Bazzill’s Robin’s Egg cardstock– this color is out of this world!! 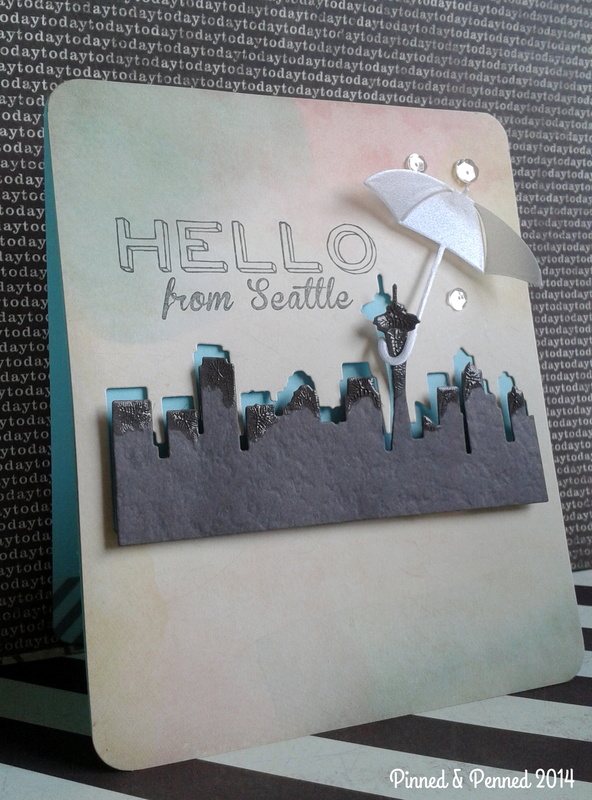 I decided to use the silver vellum umbrella for a little shine and added clear sequins for some rain-droplet sparkle. I love my Color Box Charcoal pigment ink, but decided to stamp off on a scrap then stamp onto the panel as it created this lovely soft grey that worked so well with the “watercolor” paper it almost looks like it is part of the background. I didn’t have any grey in my collection close to this, so it was a perfect technique. So stamp off to create a color you might want but not have in your collection– works well with your darker pigment inks! TIP: HEAT SET YOUR INK! And remember, heat set your pigment and oil-based inks, like Versafine. If you don’t, smudge is bound to happen. If you smudge the Versamark and catch it early enough, a good art eraser might be able to take up the still wet ink (I had success a couple times with small smudges). But once it sets, that’s it. So get that heat gun out and fired up! It takes an extra minute, but it’s worth it! Finally, I had a little scrap piece from some water-coloing and misting a few week’s ago. I liked what was left over and when I stamped on it, I liked it even more. So I made a postcard! 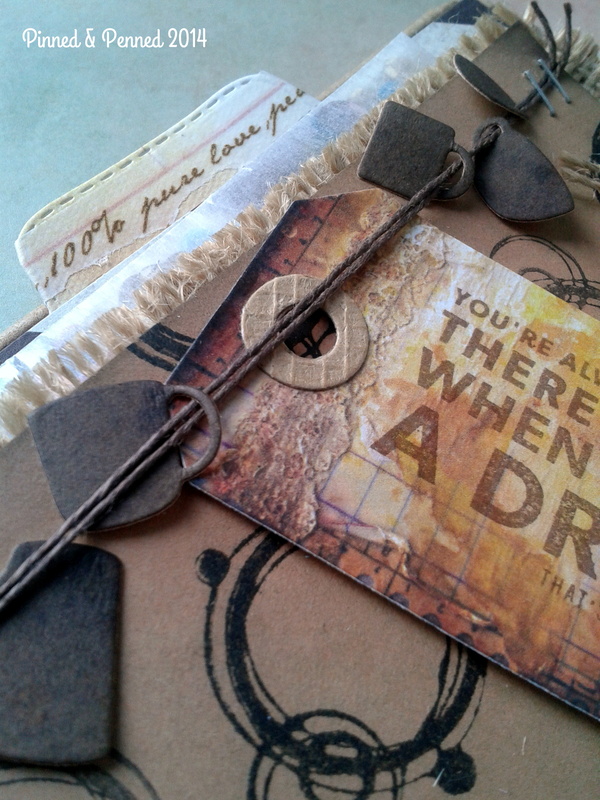 I used Lawn Fawn’s You’ve Got Mail. Super simple. I may put in a vellum envelope and send out, as it would look good behind vellum! 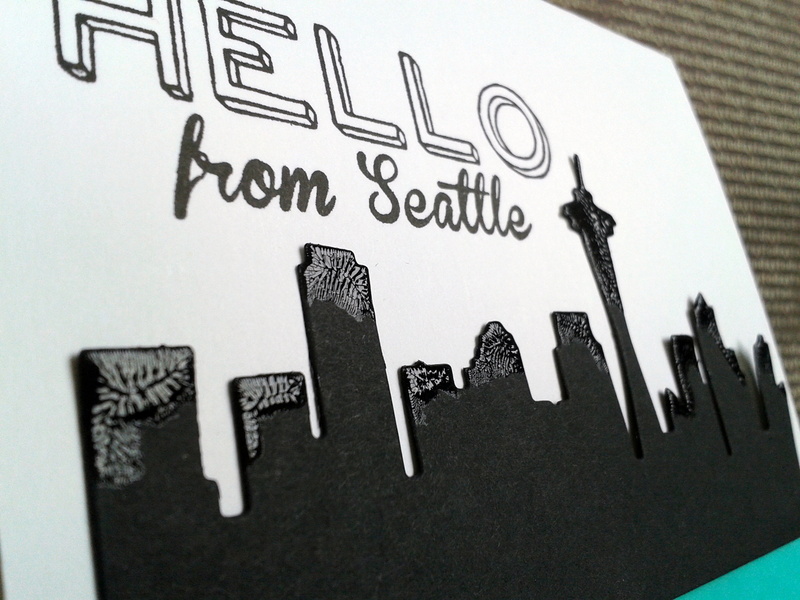 The scrap was adhered to 100# cardstock with Mod Podge, so it is stiff and durable. All stamping was done with Versamark just in case I do send as a postcard, then the ink won’t run. And all four creations together! Well, since the theme is Seattle, I must share with you a fabulous coffeeshop that is relatively new to our area and following in the footsteps of some other great third wave coffeeshops that are here and taking hold in other major cities around the US. Over the last few years, my partner and I often found ourselves bemoaning the lack of decent coffeeshops in the very city that is supposed to be known for coffee! After our travels to Vancouver, BC, Chicago, New York (yes, even New York City (not typically known for quality coffee offerings), and even more incredibly our hometown of Rochester), Salt Lake, and of course the darling to our south, Portland, we just could not get over how far behind Seattle had fallen in the world of coffee. Within the last two years, though, our Emerald city seems to be catching up, and the latest addition to the scene is Slate Roasters in Ballard. We dropped by on Sunday for a flight of single origin coffees, all of which were delightful, and happily the service was equally so. We geeked out on coffee talk about bouquet, flavor profiles, chemistry, complexity, and mouth feel with the baristas. Yes, folks, just like with good wine and beer, the dimensions of coffee are incredibly complex and exciting, affected not only by varietal, processing, roasting, grind, and preparation, but by temperature, food, and the chemistry of your own mouth. A world of wonder in that little cup of America’s favorite legal drug! My favorite of the three coffees we tried; layered, complex, juicy fruit upfront, wafer cookie and light chocolate at the end. Phenomenal! So if you are in the Seattle area, I recommend a stop at Slate. Be prepared to kick back and enjoy. This ain’t no Starbucks! 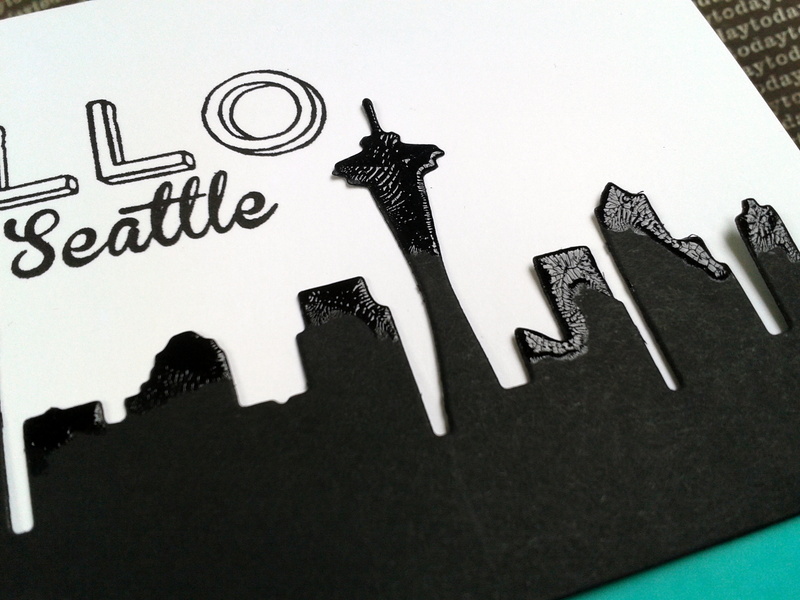 Heading to Chicago, New York, LA, Salt Lake, Vancouver, BC, or Portland, OR? Check out my other recommendations for coffee pleasure in my links on the right sidebar! 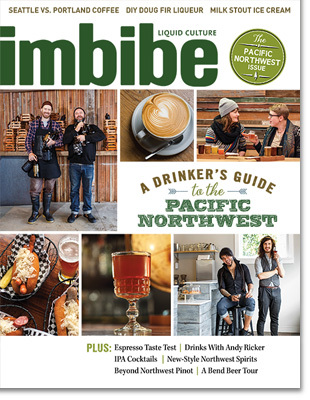 The latest issue of Imbibe will walk you through the libations of the Pacific Northwest and Seattle’s fall from and slow rise back to coffee greatness, including a feature on Slate Coffee Roasters! 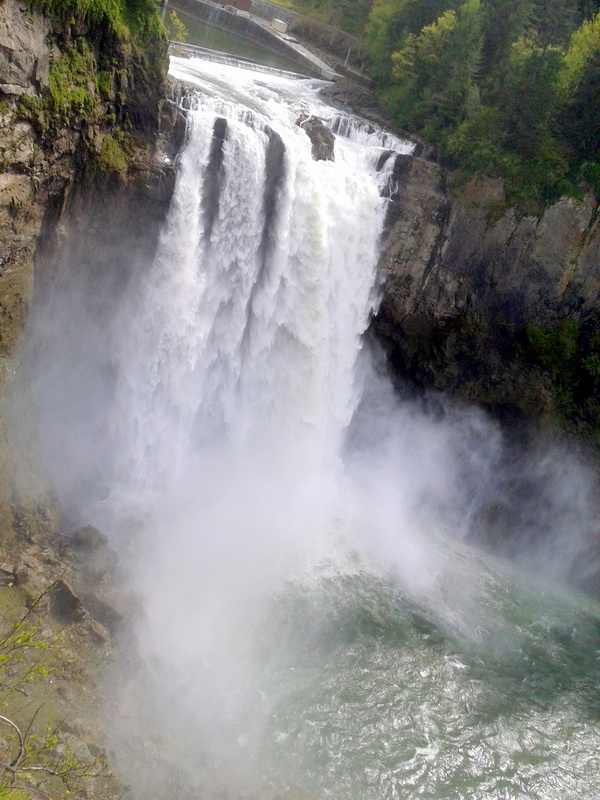 Want more recommendations for places to see in Seattle? Check out my post here. Thanks for stopping by today, and let me know if you’ve found any coffeeshops in your area or travels you would recommend! May your cup be overflowing with creativity today!